Finding the best dinnerware set to match the needs of your home, family, and budget can easily become overwhelming. There are so many options in terms of styles, designs, colors, durability, and price points that it may be difficult to know where to begin your search. You might find yourself ready to update your present dinnerware, or maybe an upcoming occasion requires the purchase of a gift. 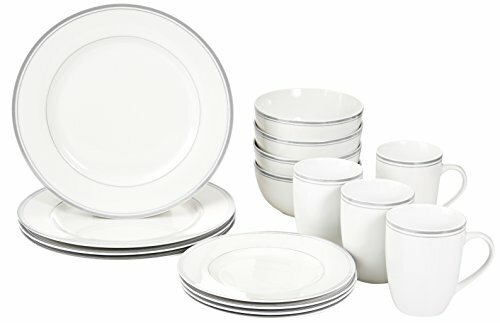 If so, then this Dinnerware Review can help you begin the search to find that perfect set. 4 Just What is Your Lifestyle? 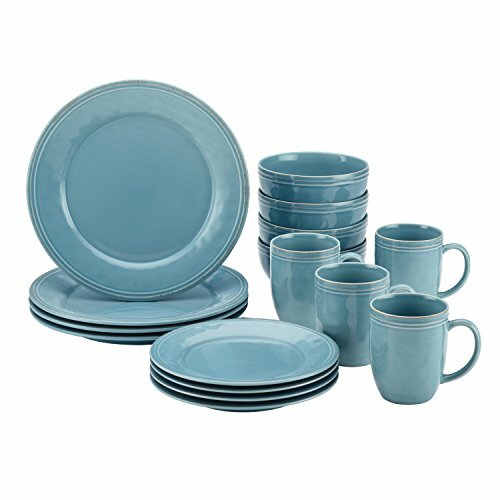 The Gibson Soho Lounge 16-Piece Square Reactive Glaze Dinnerware Set is the perfect set for a busy family! This Gibson set is available in different color options ranging from primary to pastel colors. 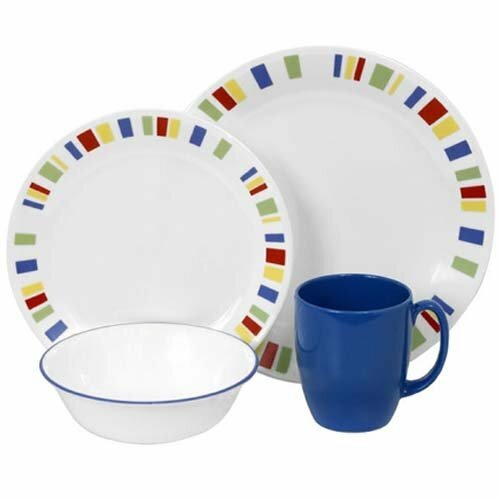 Also available is a striking multicolor set which creates the mood for fun with your place settings. And even one more choice – a clear glass variation. This is such a fun set, with the contemporary square design and so many color options from which to choose. Regardless of your choice of color, you are sure to find the perfect fit that you will absolutely love. 4 – Square Dinner Plates: 12.75"
4 – Square Dessert/Bread Plates: 9"
4 – Soup/Salad/Cereal Bowls: 6.25"
4 - Mugs: 12 oz. This is a gorgeous set for sure, and for the price you really can’t go wrong. All in all, great look and great price and is simply why this is a number one choice. If you simply are not sure which color or design to select for your dishware set, always opt for white. And if that is the case, then this is the set for you! 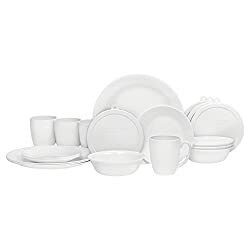 With this Corelle 20-piece Winter Frost White Dinnerware Set, you will be more than happy to incorporate this beautiful classic set into your kitchen. One of the most irritating aspects of purchasing new dinnerware is coming to terms with the fact, that, eventually some of the pieces of your brand new set will inevitably break at some point. Especially if you have kids! The good news is that with the help of Corelle, you can be sure that you will continue to use your new set of dishes until you are ready to change designs! 4 - Dinner Plates: 10 1/4"
6 – Dessert/Bread Plates: 6 3/4"
4 - Stoneware Mugs: 11 oz. Overall, these seem to be a really great value for the money, making them a steal price-wise. Some sellers may not package well. If you are in the market for a simple, affordable set of dishes then look no further than the AmazonBasics 16-Piece set. Besides being simply affordable, this set looks stunning in any kitchen or on your dining room table. It is super lightweight but also incredibly durable and is sure to stand up to everything you put it through. One unique and beneficial aspect of this set is the fact that it's actually designed to save and free up extra space in your kitchen. This is an awesome feature for smaller homes or apartments that require this size set of dishware yet don't have a lot of storage space for dishes. This set has been noted to chip and break quite easily, which is certainly something to consider. The price however is strikingly low so, all in all, it appears that you get what you pay for. That said, it may be inexpensive enough to buy a second set as a back-up for replacement pieces. This set would be perfect for a single person or couple, empty-nesters or newlyweds, at home or for RV travel. Larger household with families should just keep in mind the fragile aspect of this set. Whether you are planning a formal party or just a casual family night dinner, the Gibson Casa Estebana 16-piece Dinnerware Set is the perfect solution to help you out with all of your entertaining needs and desires. This set is sure to be the focal point of your kitchen and dining room. With its gorgeous, rustic tiling around the edges of this set, you can be sure to receive many nice compliments on your dishware! 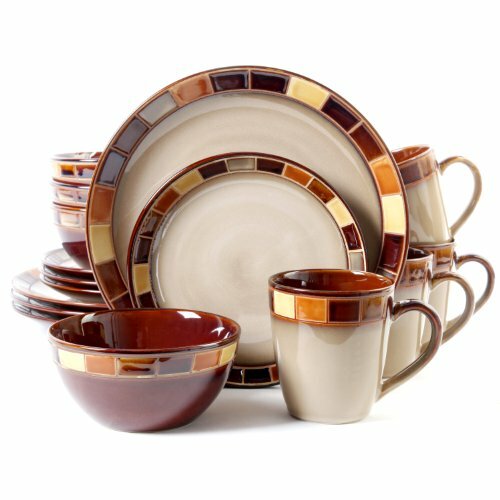 The tiled edges of this set appear to help make the Gibson Casa Estebana dinnerware pretty much indestructible. The set looks classic and beautiful in any home. Yet it is strong and resilient enough to stand up to busy families who may accidentally break and chip dishes on an average occasion. This is a gorgeous and super durable set for the price. This set looks incredible and offers a perfect, elegant looking place setting. Some purchasers have reported that the packaging used to ship the new set is less than perfect and items have arrived broken. The true color may be darker than pictured. Also, due to finishing techniques, differences in color, size, and texture ensures that no two pieces are exactly alike. That’s what makes this set so unique! If you have got the blues and are looking to incorporate them into your kitchen dining set, then look no further beyond this absolutely stunning dinnerware by Corelle. 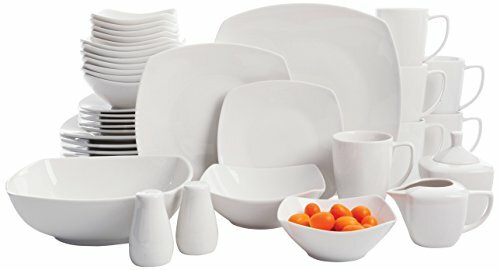 The Corelle Livingware 16-Piece Dinnerware Set is the perfect solution to liven up your kitchen without the hefty cost of having to remodel! Corelle Livingware is a legendary brand that is highly regarded for offering close to unbreakable dishware options. Not only are these dishes insanely durable and hard to break, but they come in brilliant designs and color options as well. 4 – Dessert/Bread Plates: 6-3/4"
4 – Soup/Salad/Cereal Bowls: 18 oz. The price is right on this good looking and highly durable set. While there have been some complaints about breakage during regular use, the vast majority of buyers have noted that they held up quite well and were actually pretty durable. For the price, along with the overall look of this fashionable set, your expectations will definitely be met. One of the best features of the Strawberry Street Set is the fact that it is fired twice to ensure its overall strength and durability. And this brand has been noted to be incredibly strong! This is an incredible set that is perfect for literally any occasion. Not to mention with 45 pieces, you can be sure that you are ready for even a last minute get-together with family and friends! Available in 5 colors, including cobalt blue and red. This set has been noted to be super strong and made of heavy porcelain. It is impressively resistant to chipping and has also been noted to have the strength to hold up to a lot of brutal, heavy usage. This is a great feature if you have a large family with little kids running around! The price is truly a steal in terms of the number of items included in this set. This dinnerware is also noted to be extremely durable (although commented to be somewhat heavy). This is most certainly an added bonus in terms of the longevity of the Strawberry Street collection. This set came with significantly good reviews. The main critical reviews were due to manufacturing imperfections. However, if you are seeking a set of dishware for a great price, this may be the best option for you. 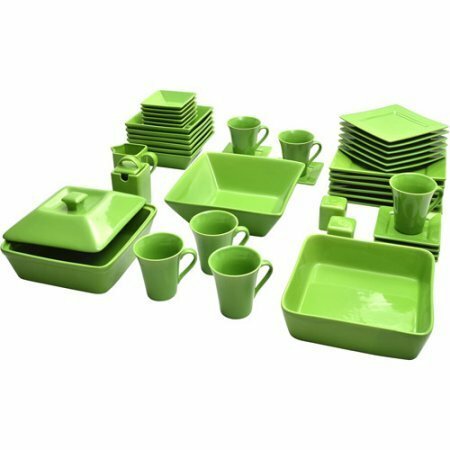 This Rachael Ray Cucina 16-Piece Stoneware Dinnerware set is such a cute, classic design that can only come from the design of the infamous Rachael Ray Collection! One of the finest features of this gorgeous dish set is that is that it also is available in a number of various color options. So, regardless as to your kitchen’s color scheme, you are sure to find the perfect match. 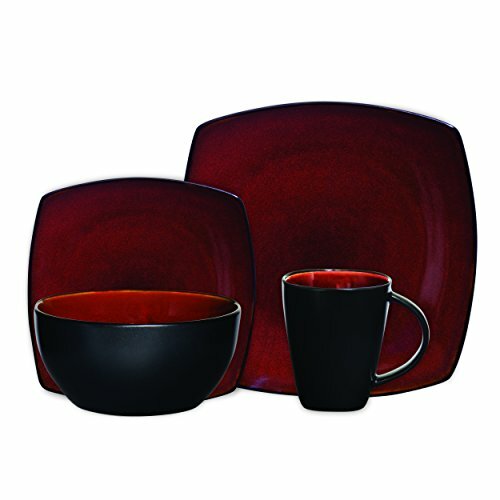 This dinnerware set provides a unique combination of the old with the modern convenience of functionality. 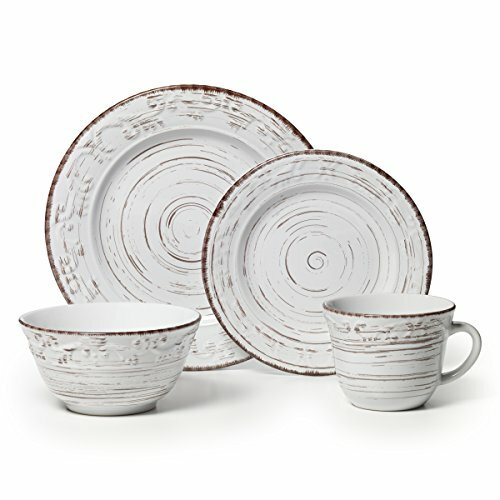 The Rachael Cucina set is created from the incredible durable stoneware craftsmanship and is topped off with gorgeous earthy tones and a unique glaze that only adds to the rustic vibrations of this set. Buying this set of dinnerware from Rachel Ray opens up a whole spectrum of choices when purchasing additional pieces from the RR collection. All in all, this is a great buy. The dishes are gorgeous and provide your kitchen with a super unique, classic antique feel. This pattern is available in a number of color options. Buyers noted the dinnerware to be fairly durable, and fairly priced. 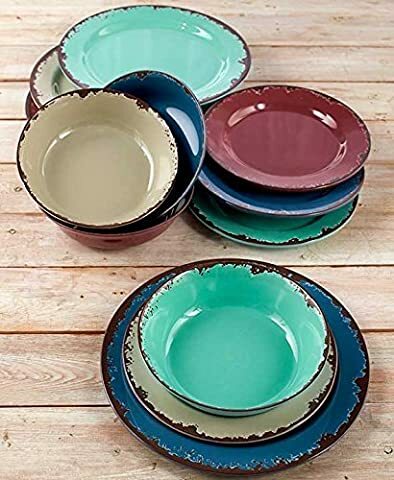 This 12-piece Rustic Melamine Dinnerware set is uniquely rustic looking and is the perfect fit for virtually any kitchen from a modern one with a twist to one that is filled with the presence of antiques galore. If cleaning up broken bowls and plates is not acceptable as part of your kitchen duties, then this may be the set for you! 4 – Soup/Salad/Cereal Bowls: 23oz. This set comes with an attractive price tag, and since it is shatterproof, you can be sure that it will last for many years. If you've never invested in dishes made from melamine, you'll be in for a treat as you come to love this type of material. Appearance is similar to ceramic but without the negative characteristics intrinsic to ceramic composition. This Pfaltzgraff Trellis White 16-Piece Dinnerware Set boasts a stunning embossed design that also provides you with a gorgeous antique-looking finish. The set is super sturdy with its reliable stoneware strength and is the perfect fit for any classic kitchen or dining room table. This Pfaltzgraff set offers an elegant, dainty look and with all the resiliency and durability you would come to expect from a stoneware set. The color and design is elegant all on its own and is sure to look good in both the breakfast nook as well as a formal occasion in the dining room. 4 - Dinner plates: 11"
4 - Dessert/Bread Plates: 8"
4 - Soup/Salad/Cereal Bowls: 6"
4 - Mugs: 14 oz. This falls on the higher end of the price spectrum, but the value seems well worth the money spent on this beautiful stoneware dinner set. This set is both incredibly durable and extremely good looking. It most certainly comes with a huge thumbs up in terms of price, value and appearance. Versatility surrounds this dinnerware selection as it is great for everyday use as well as an elegant dinner party. It is an exceptional buy that you can be sure you will enjoy. 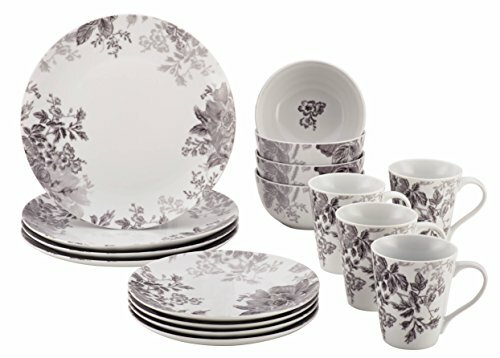 This BonJour Dinnerware Shaded Garden 16-piece Porcelain Dinnerware Set is a fan favorite. If you are unsure about what color or design to invest in, this is a great way to go! This black floral design of this set just screams elegance but is reserved enough to not look overbearing in a simple kitchen. One of the finest features of this dishware set is the fact that the roses are hand designed from an artist's renditions. They bring a simple sense of beauty and can add a spark of class to any standard kitchen. This set may seem a bit on the higher end of the pricing, however the positive ratings for this set in terms of its overall value were through the roof and you certainly can't go wrong with that! You can’t go wrong with this set. It is beautiful, elegant and incredibly durable. All in all a truly exceptional buy. This set comes at a wonderful price and is noted to be highly durable. The black and white floral pattern is sure to look incredible in any kitchen and it both elegant for a classy dinner party and casual enough for every day use. Package not very well, have been noted to arrive with broken pieces. Use caution when selecting where you purchase them from online. Take into consideration the dimensions, high/low, and width of your kitchen cabinets. You’ll want to be able to easily store and access all the pieces of your dinnerware. Also, check your dishwasher internal size, tub and spacing of racks. Take a look at the various cleaning and other cycles available on your dishwasher model. For example, a china cycle provides a gentler cycle to protect delicate items. Your lifestyle definitely affects your decision when choosing new dinnerware. Buy what you like as to size, shape, or color…plus what fits within your budget that is allotted to a new dishware set. And ask yourself, do you want matching accessory pieces or would complementary colors/patterns be acceptable. Just What is Your Lifestyle? Do you like to entertain friends and family? Do you like to serve and eat your meals on plates, in bowls, etc. with each food item placed in its own dish? Or do you like to serve buffet style if the occasion calls for it? Do you do more home style presentations vs formal? What is your family composition…two working adults, stay at home parent, family constantly on the go? Do you eat at a table or in front of the TV most of the time? How about outdoors…would your purchase of dishware be used outside? If you are simply unsure or feeling overwhelmed as to the exact color or design that you want and just can’t determine which is going to be the best fit for your kitchen decor, then just select a simple white porcelain set. It fits every color and decor and is a classic design that is just a great, simple option. If you are unsure of the place setting count that you should invest in, think outside the box a little. You should be sure that you have enough to host a dinner party, at least. If you opt to purchase a 4-piece place setting, then the in-laws will be eating on paper plates when they come to visit! Let’s follow up on the concept of hosting a dinner party. If you are someone who plans on having guests over often throughout the year, you may want to invest in two different dinnerware sets for the sake of convenience and using the “good dishes” for a family holiday. 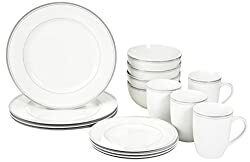 This way, you can be sure that you have your main dinnerware set for yourself and your family (which is great if you have kids in the house and your dishes may break often), and also your nicer, larger set that you just keep stored until company arrives. And finally, be sure to invest wisely. A lot of people who are in the market for a new dishware set will tend to select a nice design, and then look at the bottom line price tag. While this may seem like the best way to go about choosing a set of dishes, you should always consider the fact that you usually get what you pay for. Do some research on the brand that you are interested in and read some reviews about the durability of the set. If you are going to pay less for more, but they break easily, that’s a good indication that may not be the best choice.